The original of this beautiful Russian Wall Crucifix was painted in the mid-1700’s, and shows the Lord on the Cross after His side was pierced and His blood and water flowed out. 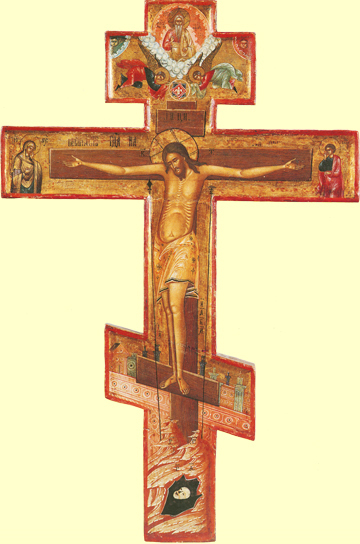 On the right and left of the Cross stand the Mother of God and St. John, His Beloved Disciple. The Cross stands on Golgotha, the place of Adam’s skull, with angels flying overhead, looking down in wonder. The sun and the moon also look on from either side of the top crossbar, and the city walls of Jerusalem are in the background opposite the bottom crossbar. The three-bars on many Orthodox crosses are often called Russian crosses because this form of the Cross was so very popular in Russia. Actually, however, it has earlier roots in one of the variant forms of Byzantine crosses. The upper bar is for the sign, the middle bar is for His hands and arms, and the lower bar is for His feet. The Lord is always shown peaceful after His Passion. The warm red and golden-brown hues and fine detail of this brilliant reproduction make this truly an exquisite icon. Christ suffered willingly, so let us suffer our smaller trials with patience and love.